This image was meant to run as an ad in the Financial Times earlier this week. They refused to publish it. “We all sip from this glass” was a comment on Amnesty’s Facebook photo page from one Jason McClurg of Melbourne. Image is in grayscale. A wine glass against a white background, full of dark, viscous sludge that is dripping down the side of the glass to leave a stain on the white surface. 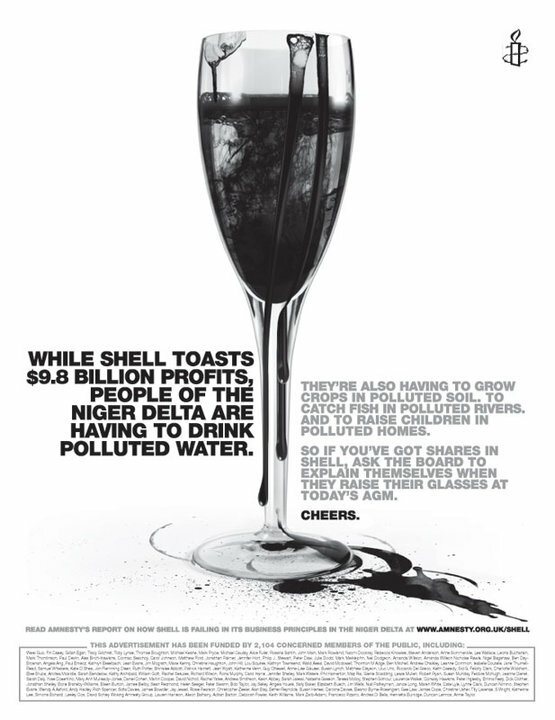 While Shell toasts $9.8billion profits, people of the Niger Delta are having to drink polluted water. They’re also having to grow crops in polluted soil, to catch fish in polluted rivers, to raise children in polluted homes. So if you’ve got shares in Shell, ask the Board to explain themselves when they raise a glass at today’s AGM.